On Wednesday, more than 300 New Yorkers – many of whom are currently experiencing homelessness – marched to Gracie Mansion to demand that Mayor de Blasio tackle record homelessness by creating more truly affordable permanent housing. 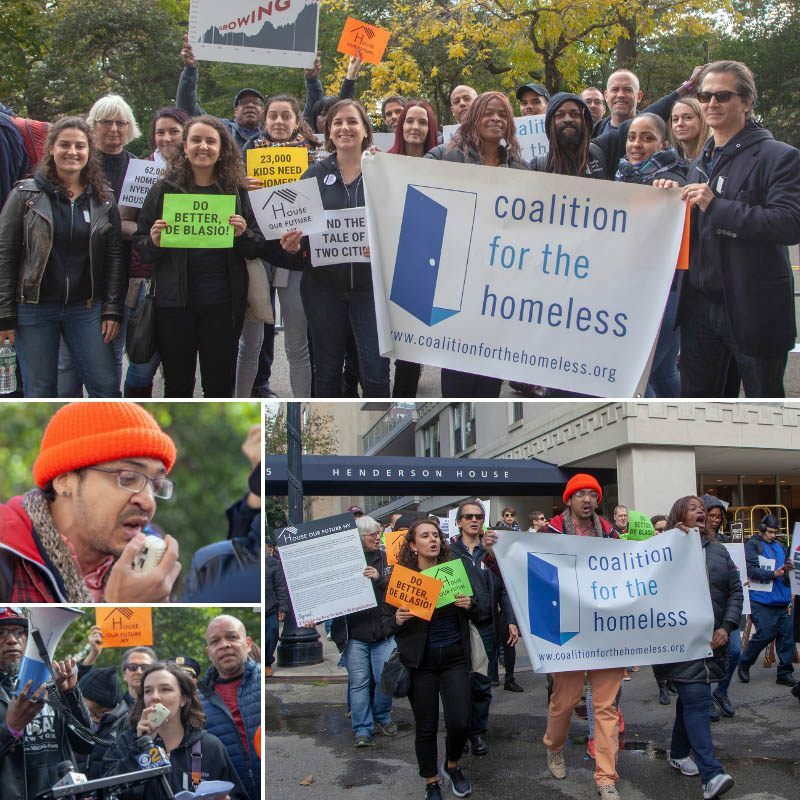 The march was the latest action by the House Our Future NY campaign urging the Mayor to set aside 10 percent of his 300,000-unit Housing New York 2.0 plan for homeless New Yorkers – 30,000 units, with 24,000 units to be created through new construction. The House Our Future NY campaign, which the Coalition for the Homeless launched earlier this year, has rapidly gained momentum as more New Yorkers recognize the urgent need for the Mayor to fully utilize permanent housing resources to address this historic crisis. The campaign has won endorsements from 61 partner organizations and 38 elected officials, and garnered significant media attention. Additionally, more than 2,300 concerned New Yorkers have signed a petition that was delivered to the Mayor at Wednesday’s march. Marcia Kramer reported on the march and rally for CBS2. Visit the website to watch the video. “I have been homeless now for four years. I am constantly searching for housing,” said Charisma White of the group Urban Pathways. The homeless and advocacy groups say there is no excuse in a city like New York for people to be sleeping on the street or in train stations. They want the mayor to commit to building 30,000 units of affordable housing, 24,000 units through new construction. “Everybody else is on board with this campaign. We’ve got 59 organizations, the public advocate, the comptroller, four borough presidents, 26 council members. The only person we’re missing is the mayor,” said Giselle Routhier of the Coalition for the Homeless. “The mayor says he’s comfortable with his approach, but his approach will reduce homelessness by 3,500 people in five years. That’s not enough. We have to make the mayor uncomfortable in his approach — 62,000 homeless people are not comfortable,” added Marc Greenberg, the executive director of the Interfaith Assembly on Homelessness. The post Today’s Read: Homeless March on Gracie Mansion, Demand Tens of Thousands of Affordable Housing Units Be Built appeared first on Coalition For The Homeless.